This is my first post in almost a month. Family stuff took up all my time. But I didn’t mind because family is important. This card has no sentiment on the front and I didn’t use any stamps or inks, just dies and cardstock. This is quite a change for me and I hope it’s not a trend because I absolutely LOVE my stamps. 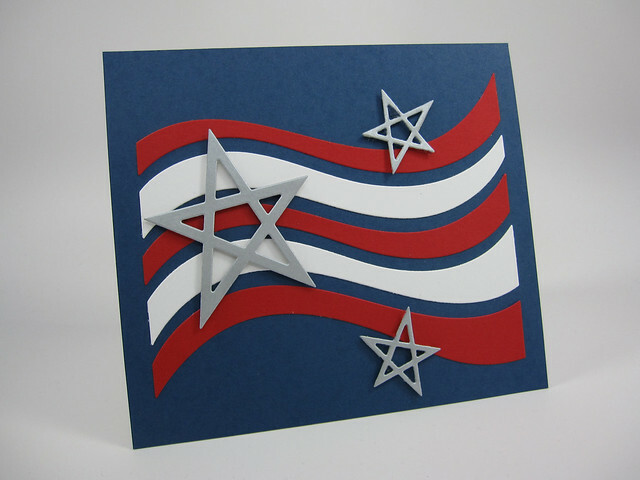 I think the iconic images of stars and stripes (in this case waves) and the use of red, white and blue says it all. Hope you and your loved ones have nice holiday weekend! Cardstock: PTI: Enchanted Evening; Neenah Solar White (110lb); Stampin’ Up: Real Red. Dies: Papertrey Ink: Sketched Stars (from the large and small collections); My Favorite Things: Ride the Waves dies. No stamps or ink (but of course adhesive)! This entry was posted in Fourth of July, Uncategorized. Bookmark the permalink.